Before start using the creams or counter medications, first, give a chance to natural home remedies to get rid of spider veins. These are the best natural remedies that prevent the problem effectively, lower the appearance of spider veins and improves circulation. Apple cider vinegar (ACV) enhance blood circulation and that why reduces the pain and swelling caused by spider veins on the skin. Fill a bowl with organic and raw apple cider vinegar and soak a piece of clean cloth. Wring it to remove the excess vinegar when you take out the cloth. Put it on the affected areas for 15 – 30 minutes. In the end, remove the cloth and do the same for 2 – 3 times daily. Note: You can drink a glass of water mixed with a little of honey and 1 tablespoon of raw apple cider vinegar to improve proper blood circulation and to get rid of your problem. Ginger makes the veins less visible and helps to break up the strength of a blood protein called fibrin in the areas where the veins are injured. Ginger also reduce the blood pressure and improve blood circulation to get rid of the problem. Cut thin slices of 1 – inch piece washed and fresh ginger root. Put these slices in 2 cups of boiling water. Keep it over low heat for 10 minutes. Then add enough honey to the tea. Drink this ginger tea to clear the spider veins. Consume ginger tea for 2 – 3 times daily till you get rid of the spider veins. Note: Another way to get relief from the spider veins is by simply chewing ginger slices, having ginger ale, including ginger in diet, etc. Before using ginger consult your doctor if you are taking any blood thinners or blood pressure medications. Horse Chestnut is a herb that builds up the veins and lowers the pain caused by spider veins with its amazing anti-inflammatory and anti-swelling effects. Also, it has been proved that using horse chestnut or its extract can remove the spider veins. Mix 10 tablespoons of distilled witch hazel with 1 tablespoon of horse chestnut. Stir the mixture well and put it on the affected area. Put the mixture for twice daily till you get rid of the problem. Note: Just put horse chestnut seed gel on the affected areas twice per day. Also, consult your doctor for taking proper dosage of horse chestnut supplements. If you take any blood medications, suffer from liver or kidney diseases, or you are pregnant you need to avoid the usage of horse chestnut. Witch hazel has tannins and volatile compounds that build up the blood vessels to reduce the appearance of veins on the skin’s surface. Witch hazel also lowers the pain, tightens the distended veins, and put right the veins into the normal structure. Put 1 cup of hot water and 1/2 cup of witch hazel leaves in a pan. Discard the leaves after 10 minutes. Leave it for few minutes to get a room temperature. Take cotton balls and apply it on the affected areas. Wipe it off after 15 minutes. Repeat this twice per day until you get rid of spider veins. Note: Mix and shake 1/2 tablespoon of witch hazel and 1 tablespoon of vitamin E oil. Then use it to massage the spider veins affected area. After it dries completely just wash off with cool water. Cayenne pepper contains a compound called capsaicin that stimulates the proper circulation of blood. It also reduces the swelling of congested swollen veins and the pain. Fill 1 cup of hot water and add 1 teaspoon of cayenne pepper powder. Stir well and drink it to get rid of spider veins. Consume the cayenne pepper drink for twice daily till you satisfy your expectations. Note: Include cayenne pepper in your cooking, also put capsaicin containing gel or cream to the affected area to get rid of inflammation and swelling. It’s not recommended pregnant women to take cayenne pepper. You need to make some lifestyle changes and follow them 2-3 times daily to clear the spider veins. 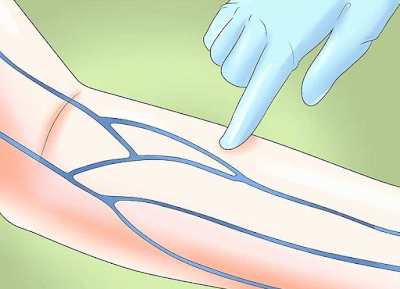 You will reduce inflammation, pain, and tenderness by improving the blood circulation with regular oil massage(coconut oil, olive oil, castor oil or mustard oil) for 10 minutes of the spider veins affected areas. Exercise enhances the circulation of blood to the overall body, reduces venous insufficiency problems and strengthens the veins. Swimming, jogging, walking, or climbing stairs daily will relieve spider veins. Elevation improves blood circulation and reduces the pressure to the affected area. You can put a pillow under the affected hands or legs for at least 15 minutes for 4 – 5 times per day or while you sleep. Compression stockings improve circulation, relieves pain and swelling. They are available in waist-high lengths, thigh-high and knee-high. First, consult your doctor to know what type of stockings will help you to relieve your spider veins. Diet is very important in treating your spider veins, strengthens your body and improves blood circulation. Include high – fiber foods like berries, flaxseeds, peas, carrots, oats, whole grains, beans, etc. to prevent constipation which in turn aggravate spider veins or varicose. Include foods that are rich in vitamin B, C and E like green vegetables, guava, oranges, red peppers, grapefruits, nuts, and seeds, etc. to enhance blood circulation along with elastin and collagen which makes the vein walls flexible and strong. Include more antioxidant-rich foods like berries, red beans, prunes, green tea, artichokes, cabbage, apple, bell peppers, spinach, etc. will help to have healthy and strong veins. Follow some low salt diet and cit down your salt intake. Drink a lot of water, herbal teas and fruit juices to stay hydrated. Include spicy foods by adding spices like black pepper and garlic which helps to break down a hard stuff around the varicose veins that is called fibrin.